I got to thinking about procedural atmosphere composition, and decided we ought to have a thread dedicated to the topic. Specifically, at least as far as I am aware, there have not been found any procedural atmospheres that are close to breathable by humans. (Apologies if someone has posted one and I missed it). 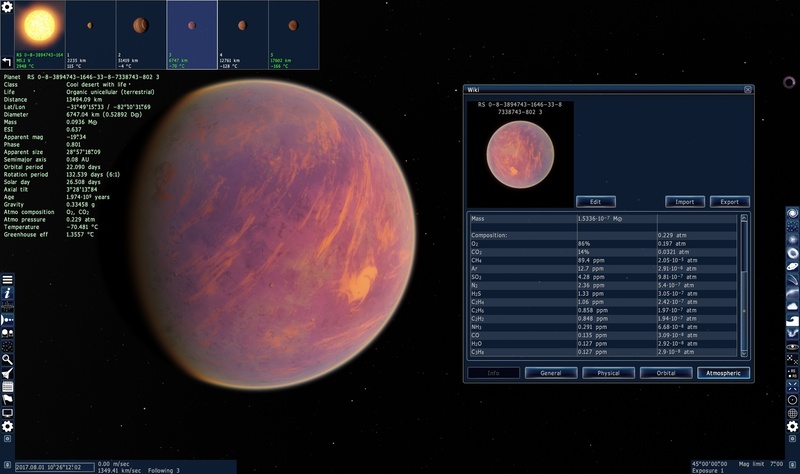 I began doing some system searching, focusing on temperate terras with life on them. 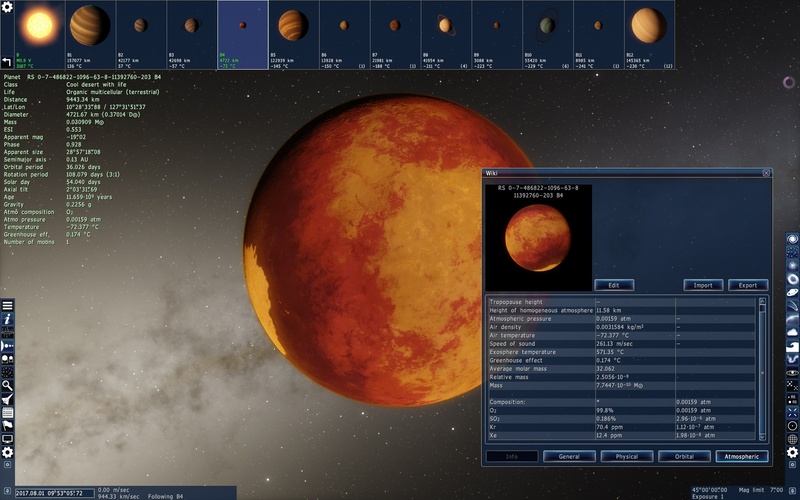 It seems that the most common atmospheres on these worlds are CO2-O2, meaning CO2 is the primary component, followed by O2, and then other things. This is by far the closest thing to Earth-like air I have ever seen. 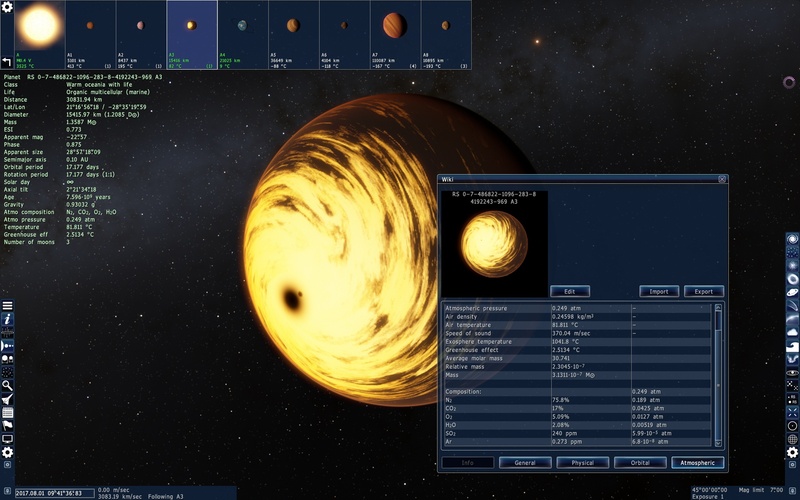 It's still not breathable to humans, and the planet is an oceania rather than a terra, but it looks like compelling evidence that Earthlike atmospheres can be generated in Space Engine. There must be a procedural planet with breathable air on it out there somewhere. So I encourage people to look, and post their finds here. Nearly 100% Oxygen. Very low pressure though, so it's not combustible. Find the partial pressure of the gas in the atmosphere you're interested in. 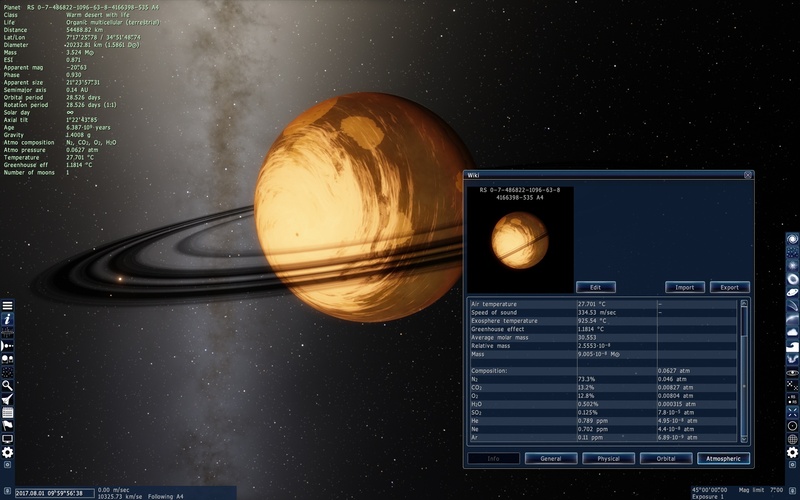 In Space Engine this is shown in the right-most column of the atmospheric tab when you bring up the planet's info/wiki box (by pressing "I"). Partial pressure is listed in units of atm. Basically it just means how much of the total surface pressure is caused by that particular gas. For example, if a planet has 2atm of surface pressure, and is 90% O2 and 10% CO2, then the partial pressure of O2 is 1.8atm, and CO2 is 0.2atm. Then see where this lands in the chart to see the effects. The second column lists the partial pressure in atm. The first column lists what this would be in terms of percent by volume or ppm, if the planet had 1atm of surface pressure like Earth. 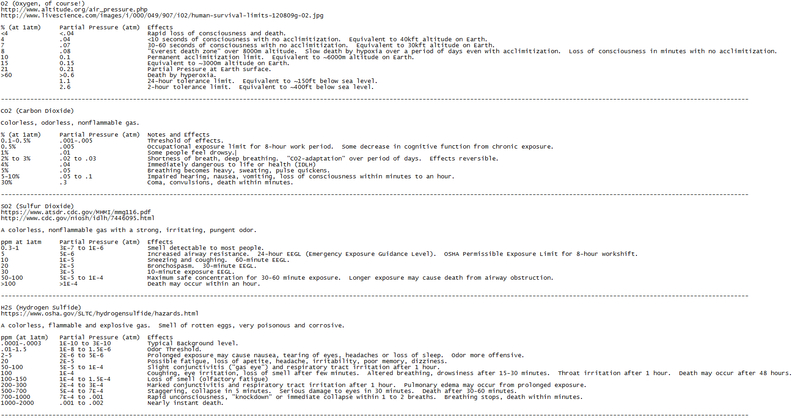 (This makes for easy reference to available information on exposure effects). The first planet with breathable air has been found -- a desert orbiting an M-class star. Based on search results so far, it looks very probable that breathable air could be found on terras and oceanias as well. 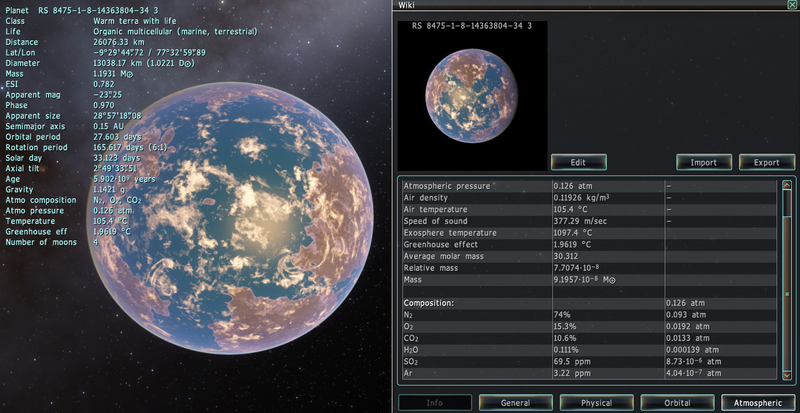 I found an Oceania with very little CO2, the partial pressure is only 0.0155 atm, which is unconfortable, but not immediately lethal. Unfortunately the O2 partial pressure is low, only one quarter that that on Earth, so hypoxia is very much a threat. Not to mention that it's a really warm Oceania, at 73 Celsius, and the sea is over 30 km deep! After scouring through 300 temperate, terrestrial planets with life, I found something fascinating. It's a nice planet, about the size of Earth, with a thin, but very interesting atmosphere! When talking about O2 and CO2, their partial pressures are what is important. On Earth, at sea level, the oxygen partial pressure is 0.2105 atmospheres, and on this world it is 0.148. You feel this kind of pressure on mountains about 2.5 km high, so it is very survivable! The CO2 thing is more of a tackle, but it appears that that pressure, of 0.0148 atmospheres, isn't that poisonous. It would be the equivalent of 14900 ppm in our atmo, which isn't a confortable concentration, but you can live with it without much trouble. It is well below the limit of 40000 ppm of immediate danger as written on the Wiki, and I read an interesting study in which a group of mice were exposed to 1.5% CO2 (15000 ppm) for 30 days and they lived, even though they had weird side effects regarding the Calcium-Phosphate cycle and other things. Anyway, this is the closest to a breathable atmosphere I saw, although I might have missed someone else' post. The rest of the system is kinda compact, with a yellow dwarf bigger but less bright than the Sun, three other rocky planets and a gas giant over 10 Jupiter Masses, with four moons even bigger than the other terrestrial worlds. Also, the world is teeming with bacteria (do not drink the water, or else be prepared for a space salmonella infection! ), it's really cold (average -23 Celsius) and it has a really close moon (it looks 17 times bigger than the Moon), orbiting every 22.33 hours. Actually, they are both tidally locked: it is a true binary planet system. I'm gonna search more tomorrow, I had enough for today. It seemed that the yellow dwarfs harbor many more temperate terrestrial planets (I found 130 near the Pillars of Creation) than orange (110) or red (60). 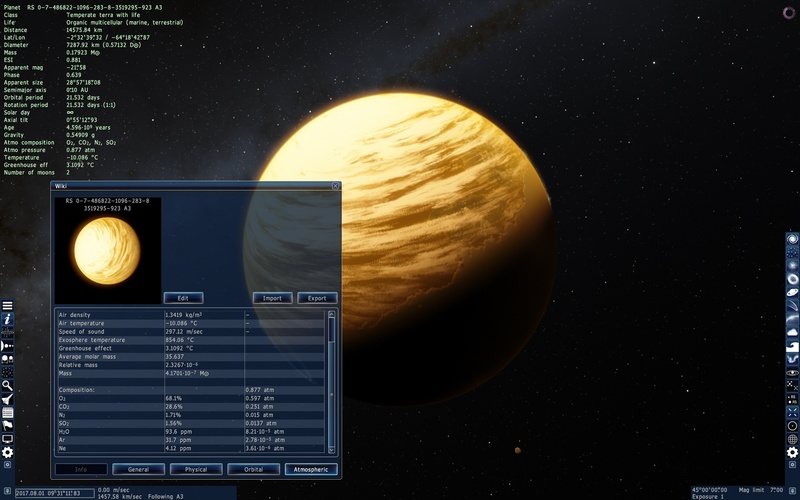 Brown dwarfs, sub brown dwarfs and planemos had very few, if any such planets. I didn't look yet at other types. That amount of CO2 in the atmosphere would most certainly kill you despite there being enough oxygen. I found a planet awhile back that was abut 75% Oxygen and a really weird day cycle (It was long enough that lets just say any intelligent beings would measure their days by half-years +/- a little bit) but unfortunately the atmosphere in general was 14 atmospheres of pressure and from what I remember, about 20 percent was CO2 and two percent was SO2 so it's quite a deadly atmosphere...I also looked in my saved locations (I thought I had saved it there) and it wasn't there, unfortunately. Ah, I thought anyway with oxygen, it could still breathed with carbon dioxide :(. Diakonov, That's a really nice one. Big ESI value, too! The O2 is at a breathable level, but sadly the CO2 is right above the immediately dangerous level. SO2 would also be really bad. So, with Stefan's find we know we can find breathable (if not necessarily comfortable) levels of O2 and CO2, which is awesome, but it looks like the SO2 will probably be the deal-breaker in most of those cases. The human body just has a really low tolerance for it -- we're sensitive to even 1ppm SO2 at Earth's surface pressure, or 10-6 atm of partial pressure. 10-3 atm would be fatal in minutes, 10-4 is "immediately dangerous" and fatal in an hour or so, and 10-5 is about as much as you'd want over an hour without serious problems. I doubt we'll be likely to find such low values for SO2 with otherwise breathable air, but who knows. The worlds you've all found so far have been fascinating. Doc, thanks for those graphics, they're very helpful! The closest thing to an Earth like atomophere I have found so far is this oceania here.It's RS 8474-2281-6-65485-118 4.The atmospheric pressure is almost exactly 1 atmosphere . 70 percent of it is CO2 and 28 percent oxygen with SO2 at 0.35 percent. After the oceans of the planet, will make the cities next to them and closer to the poles , and maybe we can lower the temperature of the planet. Too much C02 to be habitable for us, maybe too much S02.